Cocoa, found in chocolate, is a delicious and tasty ingredient that most people associate with dessert. But, cocoa is also a healing food. It contains some pretty potent antioxidants called flavanols. Flavanols have been shown to increase the formation of endothelial nitric oxide. Nitric oxide is critical to the health of your cardiovascular system. It plays a direct role in vasoconstriction and vasodilation, which help regulate your blood pressure. While previous studies have shown that cocoa-rich foods may reduce blood pressure, recent trials have had conflicting results. Researchers at the National Institute of Integrative Medicine, in Melbourne, Australia, decided to get to the bottom of the issue. They noted that high blood pressure is an important risk factor for heart disease, attributing to about 50% of cardiovascular events worldwide and 37% of cardiovascular related deaths in Western populations. They set out to determine the effect of flavanol-rich chocolate or cocoa products on blood pressure in people with or without hypertension. The research team searched all of the major medical databases, and found 20 studies that met their inclusion criteria. After analyzing the 20 studies involving 856 mainly healthy participants, the researchers found a statistically significant blood pressure-reducing effect of flavanol-rich cocoa products compared with control. 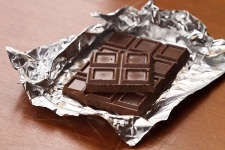 Adverse effects, including gastrointestinal complaints, and distaste for the trial product were reported by five percent of patients in the active cocoa intervention group, and one percent of patients in the control groups. The researchers concluded that flavanol-rich chocolate and cocoa products may have a small but statistically significant effect in lowering blood pressure in the short term. They suggest that more trials investigating the effect of cocoa products are needed to determine whether or not blood pressure is reduced on a long-term basis by daily ingestion of cocoa. So far, so good on the cocoa front. There are a few people who may react negatively to chocolate consumption because of an allergy, sensitivity, or a reaction to the caffeine in chocolate. For the rest of us, this study is a green light to go ahead and keep eating chocolate—in moderation, of course! For more on the potential health benefits of chocolate, read the article Fighting Insulin Resistance with Chocolate?.